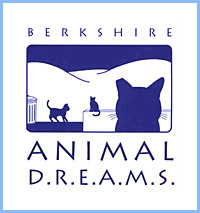 Their mission is to improve the lives and promote the humane care and acceptance of feral cats throughout Berkshire County and beyond. Through Trap-Neuter-Return (TNR) the population of feral cats will become stabilized, with healthy cats and a zero reproduction rate. Through advocacy, education and action, they raise awareness and activism among citizens, animal care professionals, local government and the business community.  Click on logo to enter the site.